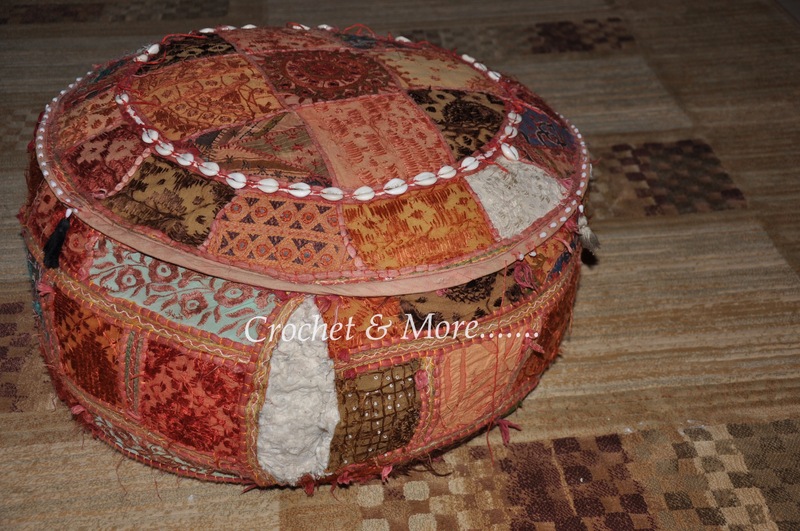 Oh……..Alrite….I had this pouf which had bust it’s seams and needed to be fixed…:-D!!!! 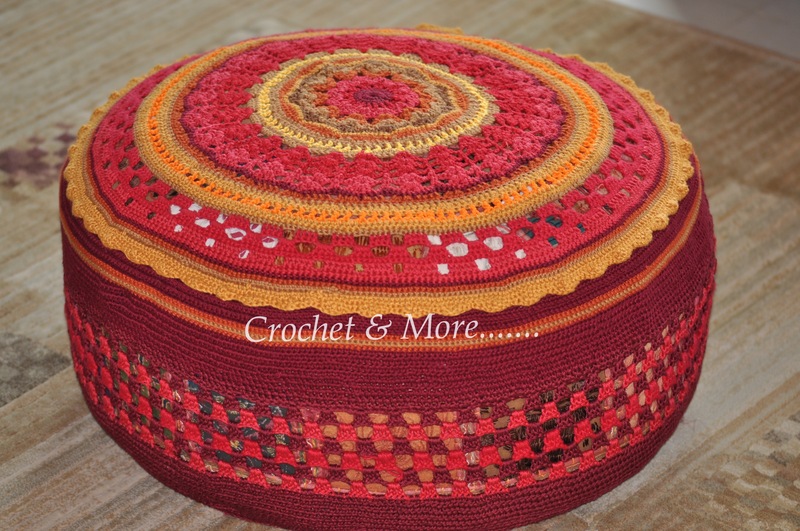 First you need to make the surface of the pouf….I used a Mandala pattern. 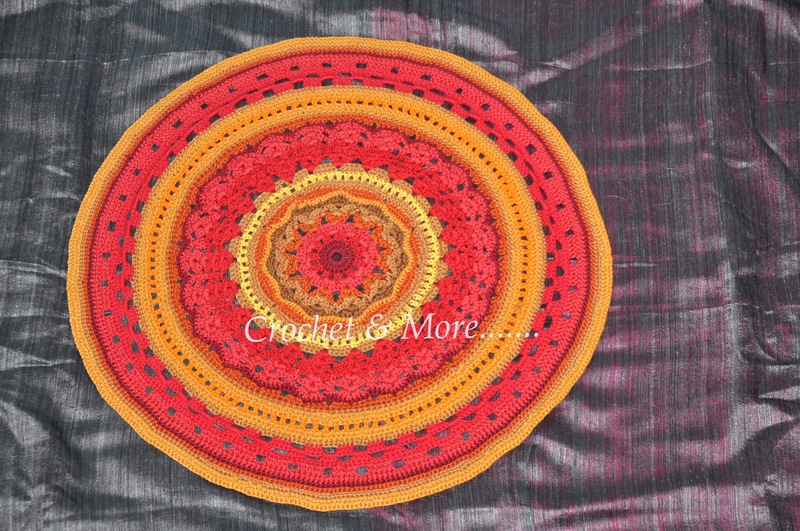 You may have seen that post…Here is the link to that post….do the mandala accordingly. 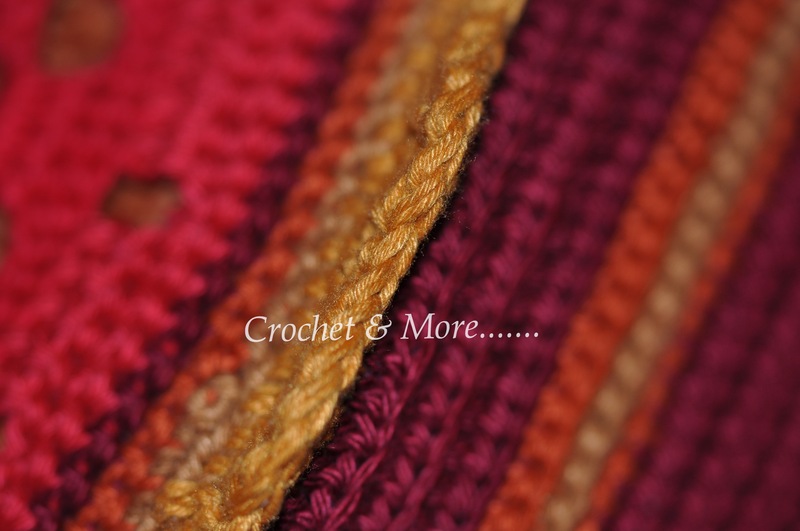 Bali Ochre and Brick….25 gms approx. Hook in one hdc per chain until end of round. SS. 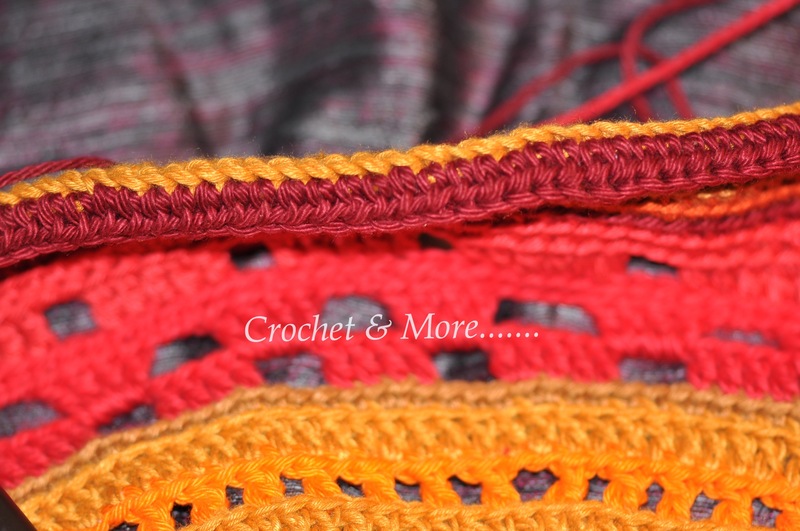 Then, I began to reduce the stitches cos the shape of the pouf that I was working on was such…. 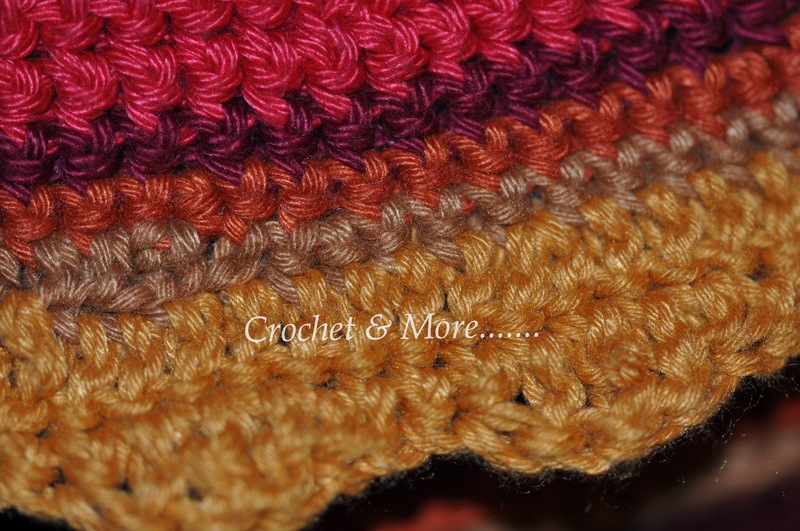 I began with missing one hdc every 30 stitches for the next 4 rows. hdc in every chain in the next row. 3 chain up, 2 dc in next 2 hdc; 3 chain skip 3 hdc; *3 dc in next 3 hdc; 3 chain, skip 3 hdc; 3 dc in next 3 hdc;* Repeat until end of row…ss into the 3ed chain of the starting 3 ch. 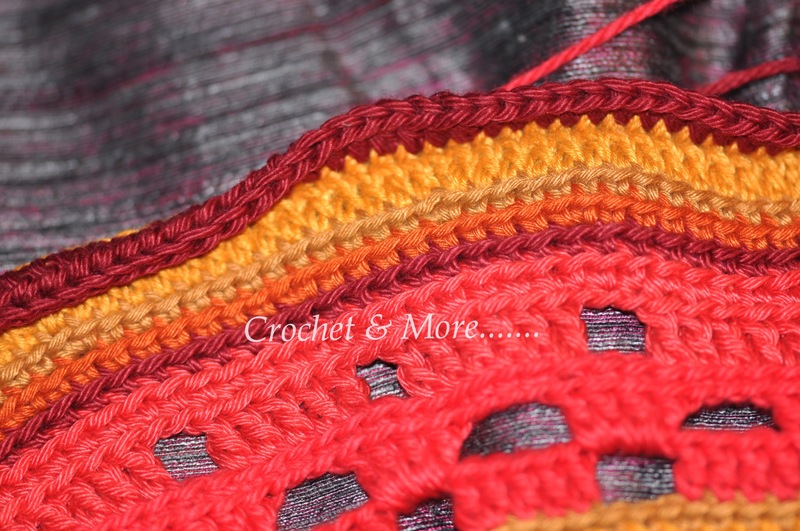 Chain 2 chain up; 10 hdc in each hdc ; skip one hdc….continue by reducing one stitch every 10 hdc. End with a ss. 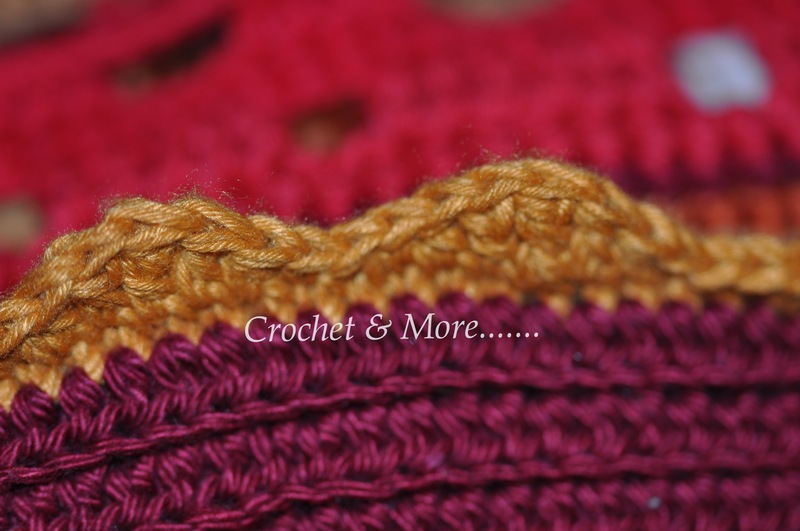 Slip stitch in every hdc. This gives the project a smooth, professional finish. 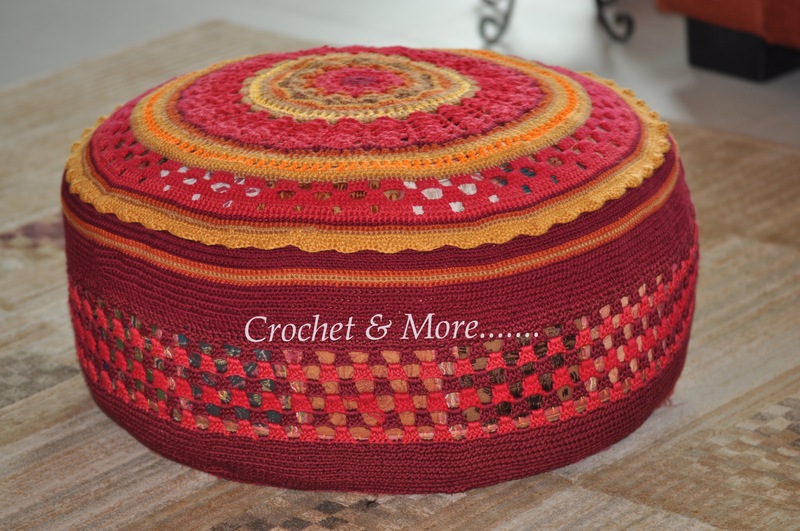 The piece now fits well over the pouf…but you need to cover the area where the Mandala is joined t the side to create a finished look. To do this I created a wave stitch around. 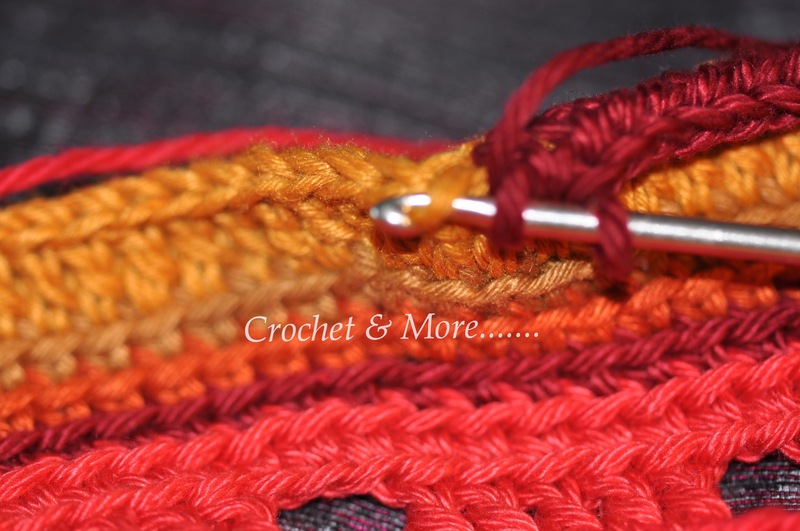 You need to make a covering stitch in the row where the last stitch of the Mandala begins to work the side…that is the first hdc stitches. 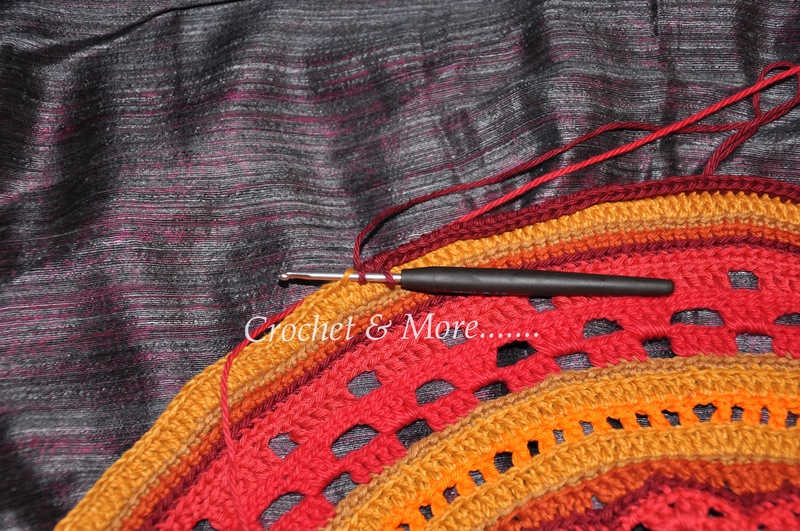 You work this covering stitch on the front loop of the last stitch of the Mandala. *sc, hdc, dc, trcr, dc, hdc, sc*; in the front loop. continue ** to the end. 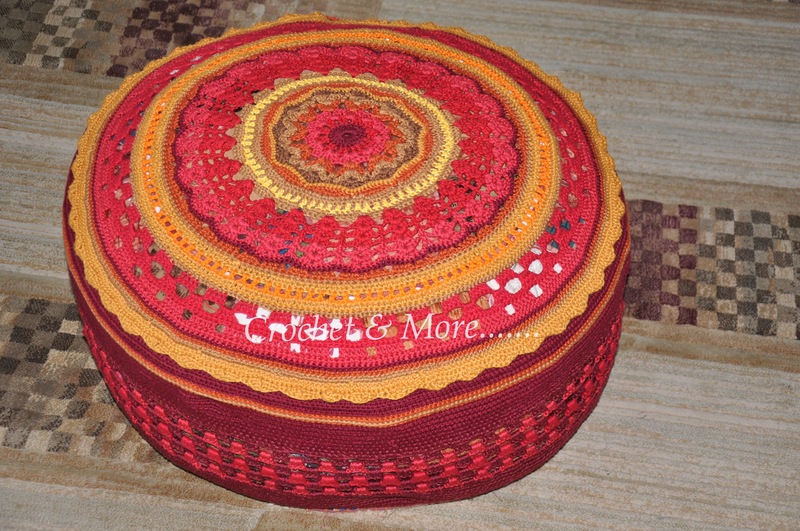 This Pouf is 25 inches by diameter and the height is 12 inches. But it’s shape isn’t even….it bulges in all kinds of places and hollows in at the oddest places……which is why the reducing of stitches is done the way it has been done…you will have to find your own way to work out the side….So this post can just, be used as a guide and I do apologise for that. Isn’t she Lovely now?….I feel like Stevie Wonders…..Isn’t she Lovely, Isn’t she beautiful, isn’t she wonderful….la……la…la…..I know silly…..but there you are…..have always liked making up stories about inanimate things…..Chalo….See ya in my next post …it’s going to be a tutorial post…..how to make rectangles….Just need to make that photo tutorial and we are done…!!!!! Take Care and may the Crochet Goddesses be with you.